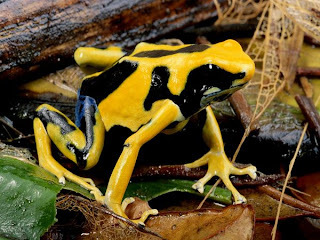 Animal Wildlife | Poison Dart Frog | Poison dart frogs are a group of frogs that are native to the tropical jungles of Central and South America. Poison dart frogs excrete toxins through their skins, and the brightly coloured bodies of poison dart frogs warn potential predators not to eat them. Poison dart frogs vary in size, colour and the levels of toxin that they produce depending on the species of poison dart frog and the area in which it lives. There are more than 175 different species of poison dart frog known to be inhabiting the jungles across Central and South America. 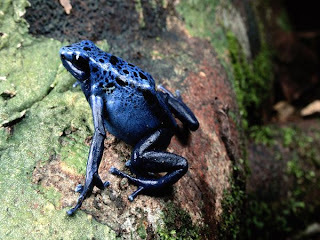 Poison dart frogs are often known as dart frogs or poison arrow frogs due to the fact that the tribes-people living close to the poison dart frogs, would use their poison in order to tip the ends of their arrows and blow-darts. Poison dart frogs live on the ground or in the foliage just above it. 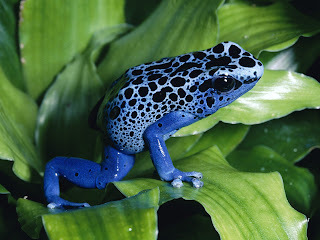 Poison dart frogs are found in moist and humid forests that are free from high levels of pollution. Today, many species of poison dart frogs are considered to be critically endangered in the wild, mainly due to pollution and habitat loss. Poison dart frogs are carnivorous animals that survive on a diet purely made up of meat. 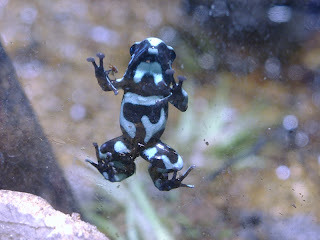 Poison dart frogs shoot out their long, sticky tongues to catch flies, ants, insects, spiders and termites. 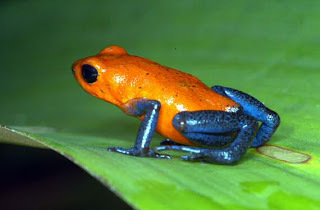 Due to the high toxin levels produced by the poison dart frog, it has very few predators in the wild. Many animals will become extremely sick from just licking a poison dart frog, so they won't approach them. There is only one species of snake that is known to be immune to the poison of the poison dart frog. Many species of poison dart frog, make devoted parents as they carry their newborn hatchings from ground-level where they were laid to the safety of the canopy above. The eggs stick to mucus on the back of the mother poison dart frog, while she carries it a water-pool in a flower high in the trees. The female poison dart frog does this with all of her babies, and lays an unfertilised egg in the water for her young to eat. 0 Response to "Poison Dart Frog"